The manufacturer has taken a 'year zero' approach with its new panels, developing new structural techniques and control systems, new phosphors, new drive systems, and new cell designs with enhanced discharge efficiency. All these factors result in a huge claimed power saving of 50 per cent versus the company's conventional sets. Further green claims include a 100,000 hour claimed operating life, and the use of a proprietary alternative to planet-spoiling lead in its construction. Inevitably, the set has an Eco Mode, too, that reduces the image's brightness if your room gets darker – a tool Panasonic claims can cut energy consumption by 55 per cent. Concerns that the P46G10's power-saving systems will damage image quality are countered by the manufacturer's claims that NeoPDP screens can deliver better black levels (the quoted contrast ratio is 2,000,000:1), richer colours and faster response times than ordinary plasma panels. The P46G10 carries a 600Hz processing system too, created through Panasonic's Intelligent Frame Creation system, which interpolates new frames of image data to replace the image data 'lost' with straight 50Hz signals. Two further key features are a built-in Freesat tuner, and an SD card slot for playing AVCHD movies and JPEG stills. Finally settling down to watch the P46G10, we find pictures that mostly surpass our expectations. 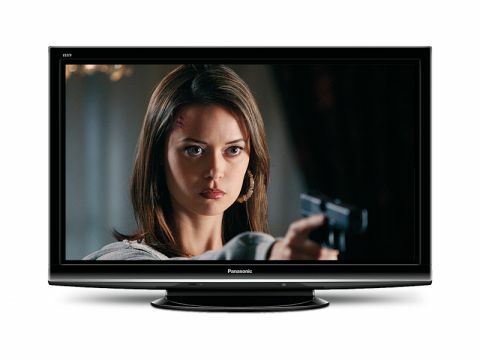 Black levels, for instance, are even better than those experienced on ordinary Panasonic plasmas – deep, rich, natural, yet also full of the shadow detailing that helps give dark scenes profundity. Colours, meanwhile, are exceptionally expressive and well-saturated, especially if you sacrifice a little eco-credibility and opt for a fairly high brightness setting. The P46G10's 600Hz setting also boosts the screen's motion handling, especially when it comes to judder control. We're not talking levels of fluidity to rival, say, Philips' HD Natural Motion system, but the situation is markedly better than with non-600Hz Panasonic plasmas. The P46G10's full HD resolution also helps it produce superb levels of detail and texture with HD sources. But it's unusually accomplished at rescaling standard def Freesat/Freeview images, too. With the P46G10's sound proving perfectly acceptable – if not quite as all-round accomplished as its pictures – is there anything bad to say about the P46G10? Well, there are still signs of judder during camera pans, as noted earlier. And colours occasionally look a bit green-tinged, with the sporadic orangey red thrown in too. But otherwise the P46G10 is (surprisingly affordable) proof that you really don't have to sacrifice quality to go green.